Camden College Park features townhomes, studio, one, and two bedroom apartment homes in College Park, MD, only minutes from the University of Maryland. Whether you’re traveling to DC, Silver Spring, Fort Meade, or Baltimore, our convenient access to I-95 and I-495 will make your commute a breeze. View our available apartments! Enjoy the many money-saving perks that Camden College Park has to offer that are also designed to give you more free time to do what you love! Finally drop that costly gym membership when you use our 24-hour fitness center complete with free weights, cardio equipment and more. The number of different workout routines are endless - start planning your next routine by checking out the fitness center using our virtual tour here. We recommend starting at the Treadwall, a rotating climbing wall for the ultimate upper body challenge! Visit the business center with free Wi-Fi when you need to get work done from home or study for a big test. Need a quiet space for a meeting? We've got you covered in our conference room. Our Welcome Center is your resource for work and play, it houses the WiFi cafe, resident lounge with billiards and provides direct access to our beautiful pool with sundeck and grills. Plus residents can take advantage of a free shuttle to the Greenbelt Metro. Our apartment homes offer distinctive details such as crown molding, walk-in closets, full-sized washer and dryer, and garage parking. Select homes offer unique upgrades, such as walnut plank flooring, built-in computer niches and bookshelves, vaulted ceilings, and a fireplace to cozy up to. Living at Camden College Park, all of your needs are within arm’s length! Just outside your door you’ll find Ikea, Buffalo Wild Wings, and a multitude of great restaurant options. There is ample green space and walking trails for our pet owners to enjoy, as well as Paint Branch Park only minutes away. Sports fans can enjoy a college football or lacrosse game at Capital One Field at Maryland (Byrd) Stadium or a Washington Redskins game at FedEx Field. Residents receive a technology package included in the total monthly rent with a savings of up to 48% off retail. This money-saving package includes high-speed internet up to 100 Mbps and over 140 digital video channels through Xfinity. Use the Xfinity Go app on your smartphone or tablet to access your digital video anywhere! What are you waiting for? Come home to Camden College Park apartments today! At Camden, your pets are family too! We welcome cats and dogs, up to two pets per apartment home, with a full-grown maximum weight limit of 75 pounds each. Call us with any pet-related questions! We'll save a spot for you! Each apartment home comes with one parking permit, with additional permits available for rent at $70 per car each month. Visitors are invited to park in our parking garage on a first-come, first-served basis. 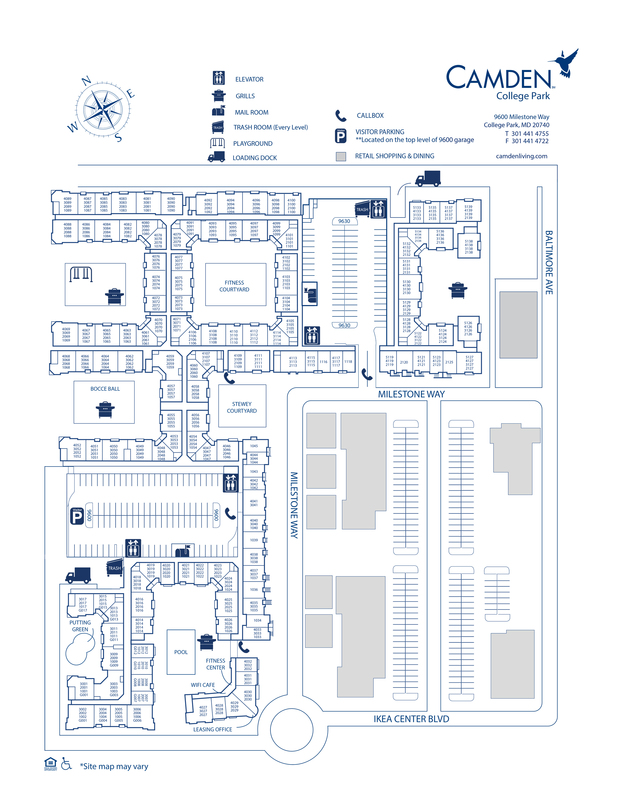 All visitor parking is on the 5th floor of the 9600 building.